SUMMER FASHION MUST HAVES | RAWR BOWS. I am back in sunny and warm Spain and, as much as I love London, I have to admit it’s not my favourite place to be during the summer - if it can even be called summer. Now that I can finally dump my jeans and my jackets, I am more than ready to rock all my favourite fashion items: high waisted shorts, off the top shirts, crochet tops, etc. I am a massive fan of summer fashion, so every time the temperature rises I get ridiculously excited to get out and get some of my favourite items I've been eyeing up for weeks. Today I am going to share with you my must have items for this season. Some of them I already own from previous years, and some of them I am excited to get hold of very soon. I have two go-to stores for my summer wardrobe - Zara and Esprit I love the first one to get the latest trends and 'knock-offs' (they are great at copying big names like Dior, Givenchy...). I go to Esprit when I am looking for a more classic and elegant look, when I'm looking for fashionable timeless pieces. First, let's start with tops. 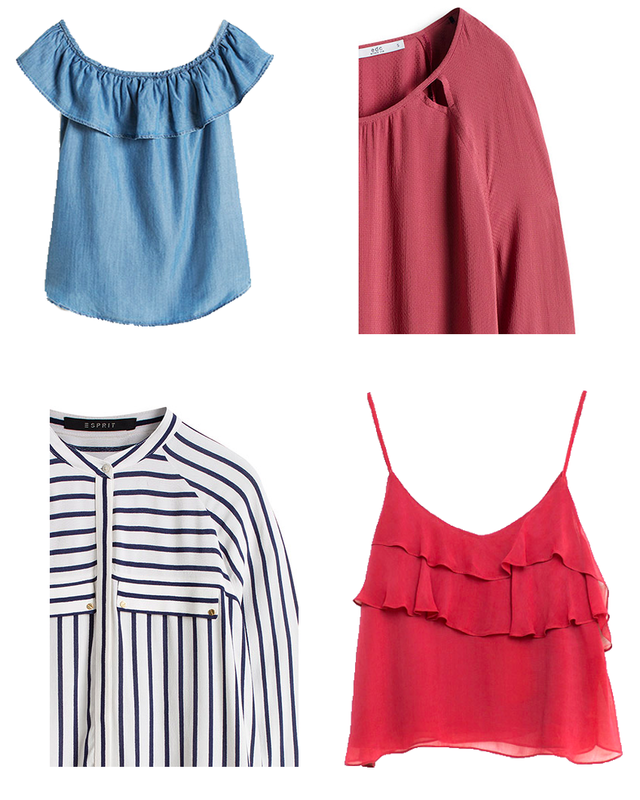 As I mentioned earlier, I am so into off the shoulder tops at the moment. I find them ridiculously flattering, even though I have to say they are not the comfiest - you know what they say though: no gain, no pain. I personally adore this denim one, and I feel like it would look awesome with a pair of ripped white shorts. I'm not usually a big fan of patterned clothes but for the past few months I feel like striped clothes have taken over my wardrobe - jumpers, t-shirts, blouses; you name it, I have it. This is why it's no surprise I am absolutely in love with this striped blouse. 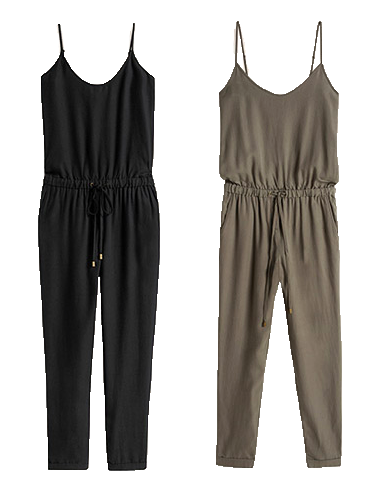 Something else I have recently been into are jumpsuits. I love how versatile they can be - casual with a pair of trainers or fancier when paired with some heels. I usually go for neutral colours like military green, burgundy, black or white. Finally, let's talk about shoes. Who doesn't love shoes? To be honest, I rarely ever buy anything yellow (or anything bright for that matter) but these mustard yellow wedges are ideal for these hotter months. 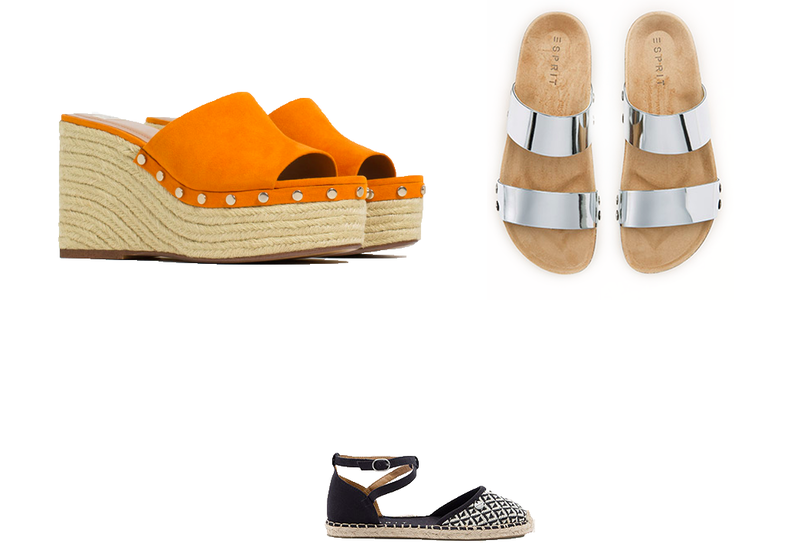 I am also very into espadrilles at the moment!